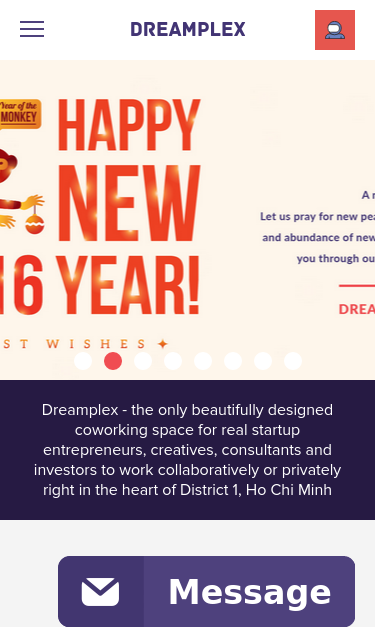 Dreamplex Coworking Space - Beautifully designed space for real startup entrepreneurs, creatives, consultants and investors to work collaboratively or privately. This analyzed URL is SEO friendly, but internal links on this page contain some links that are not SEO friendly. Your webpage has 24 'img' tags and 17 of them are missing the required 'alt' attribute. Congratulations! Your web page does not use inline CSS styles. Congratulations! Your website is using the correct version of Google Analytics tracking code. Congratulations! Your HTML size is 30.68 Kb and this is under the average web page size of 33 Kb. This leads to a faster page loading time than average. Your page do not use any HTML compression! You should compress your HTML to reduce your page size and page loading times - this will help your site retain visitors and increase page views. If you were using compression, you could be compressing your HTML size by 75 % - from 30.68 Kb to 7.74 Kb which would further reduce your page loading time. Your two options for file compression are Deflate and GZIP. Deflate is an option which comes automatically with the Apache server and which is simple to set up. GZIP on the other hand needs to be installed and requires a bit more work to install. However, GZIP does achieve a higher compression rate and therefore might be a better choice if your website uses pages which have a lot of images or large file sizes. Setting up file compression for your website will depend on which type of server you?re using for your website. Most likely, you?ll be using Apache, which means you can enable compression by adding a few deflate codes to your .htaccess file. For more advanced information regarding deflate you can check this Apache documentation. Your site loading time is around 10.901 seconds and is over the average loading speed which is 5 seconds. http://dreamplex.co and http://www.dreamplex.co/ resolve to the same URL. Your website is not using https, a secure communication protocol. Even for sites that do not collect senstive customer information, search engines suggest that switching to https is an increasingly good idea and may help improve rankings. Note: if your site relies primarily on adsense income, be aware that using https may be detrimental to ad earnings. If your website needs a secured authentication or an encrypted transfer of data, you need to install an SSL certificate in order to provide a secure connection over HTTPS protocol. HERE is a "step by step" guide to purchase and install an SSL certificate. We found 2 email addresses in your page code. We advise you to protect email links in a way that hides them from the spam harvesters. Your page does not use the canonical link tag. Your robots.txt file does not use the disallow directive. This means that the whole website can be crawled by search engines.